Apple set revenue records yet again, but next quarter's guidance still made this a strangely negative conference call with analysts. 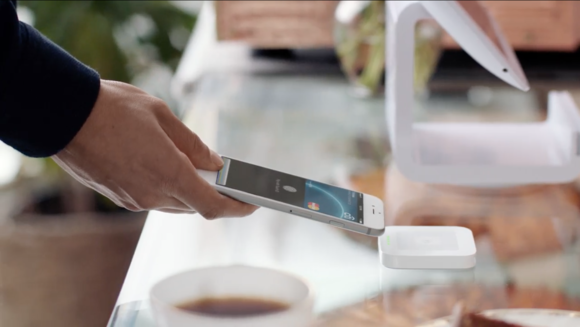 Tuesday was an Apple quarterly financial report day like none other. Not only did the company set records for revenue, profit, and iPhone sales—its $18.4 billion profit is one of the most profitable quarters for any company ever—but it got hammered by stock analysts who fear that the iPhone’s rocket ride of rapid growth has come to an end. Still, some of the most interesting news of the day comes out of the hourlong conference call that Apple executives, namely CEO Tim Cook and CFO Luca Maestri, have with financial analysts about a half an hour after the results are released. Here’s a look at the most interesting things they said (or didn’t say) in that call. “Whatever you do,” Basil Fawlty warned his employees, “don’t mention the war.” The equivalent on Tuesday was the iPhone’s lack of sales growth—iPhone revenue grew less than 1 percent when compared to the same quarter a year ago. Wall Street really likes growth, and this isn’t that. Cook tried to downplay the lack of growth and, even more damning, Apple’s admission that iPhone sales will decline year-over-year in the forthcoming quarter. While saying that Apple won’t project iPhone sales in subsequent quarters, Cook said that the second fiscal quarter of 2015 would be the most difficult to beat this year, because of sales that came from pent-up demand that Apple wasn’t able to fulfill in the first fiscal quarter of 2015. Have we reached peak iPhone? Probably not. Apple’s explanation for next quarter’s expected slip is that the pent-up demand carried over from holiday 2014 into the March quarter of 2015 will be tough for this year’s March quarter to beat. 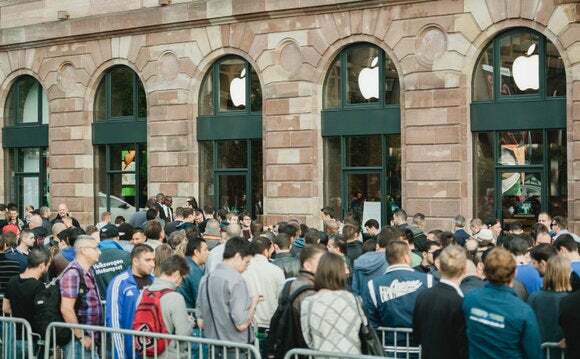 Fair enough, except that if that number was lower—if Apple had managed to make as many iPhones for the 2014 holiday season as there was demand—that would’ve set the bar higher for the first quarter, which means iPhone sales growth would have looked worse Tuesday but better in three months. The larger point still stands: iPhone sales seem to have plateaued. Nobody’s saying they’re going to drop–the smartphone is basically one of the most popular product categories in existence–but if you’re focused purely on growth, this category may no longer be as exciting as it once was. Echoing a buzzword from last quarter’s conference call, Cook cited the economic headwinds Apple faces, both in the softness of the Chinese economy and difficulty in foreign-exchange conversations. Apple went to the trouble of releasing an appendix to its financial statements (PDF) that showed its numbers in a more favorable light if currency rates were constant, rather than fluctuating as they have done. 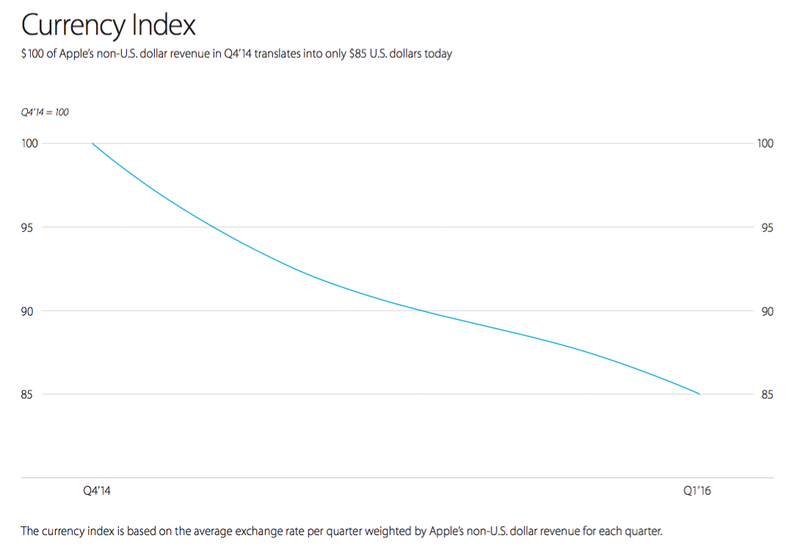 The state of currency conversions has definitely taken a toll on Apple’s numbers, hiding some progress. Moreover, in markets where the local currency is losing out to a stronger U.S. dollar, Apple is forced to choose between two difficult options: raise prices (and presumably depress sales) in order to maintain profit margins, or hold prices steady and watch profit margins dwindle. Difficulties in the Chinese economy haven’t soured Cook and Apple on China, however. “We remain very bullish on China, and don’t subscribe to the doom and gloom kind of predictions,” Cook said Tuesday. Apple revenue grew 14 percent year-over-year in China, to an all-time record $18.4 billion. Mac sales were up 27 percent year-over-year in mainland China. 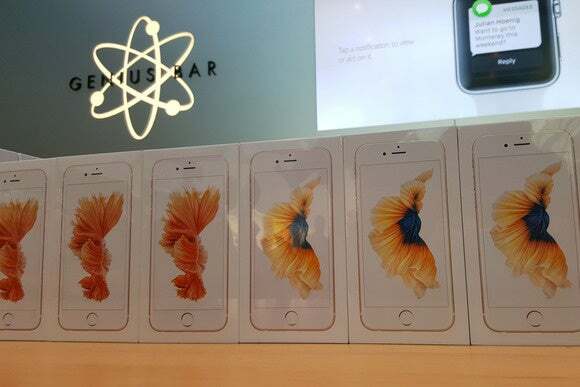 And then there’s the continued potential of the iPhone in China. “Almost half of the iPhones that we sold in China last quarter were to people who were buying their first iPhone,” Cook said, adding that he expects a huge wave of future buyers who will upgrade their existing 3G smartphones to ones that connect to faster LTE networks. Indian Prime Minister Shri Narendra Modi speaks with Apple CEO Tim Cook in San Jose, CA, on Sept. 26, 2015. 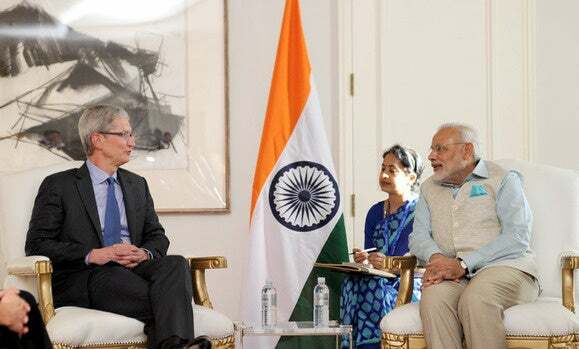 Given Apple’s small presence in India and low penetration of LTE networks in that country, Cook thinks there are “a tremendous number of people” there (and elsewhere in the world) that will give Apple opportunities to keep growing the iPhone user base. Apple also spent more time talking up its “Services” financial line, which covers the App Store, Apple Music, iCloud, Apple Pay, and more. A page in Apple’s appendix PDF was devoted to showing growth in this area, especially in categories that come from Apple’s installed base of customers. In fiscal 2015 Apple generated $16.8 billion in “installed base related revenue,” meaning money from existing Apple customers. “I do think that the assets that we have in this area are huge,” Cook said. “And I do think it’s probably something that the investment community would want to and should focus more on.” In other words, Apple is sending a message to investors: don’t sell our services business short. Services like the App Store and Apple Pay are making the company money, but growing slightly more slowly than the overall install base’s growth. However, analyst Toni Sacconaghi was appropriately skeptical of some of the numbers. Sacconaghi pointed out that while Apple’s installed base grew more than 25 percent, services grew 24 percent during the same period. “It almost implies… your penetration of your install base in terms of your ability to sell services is going down,” Sacconaghi said. Apple CFO Luca Maestri didn’t really have an answer for that one, but it’s a good question. Is Apple’s services revenue growing at a slower rate than its user base, and if so, why? And what does that mean for future growth? Given Apple’s commitment to discussing services, I suspect we’ll be hearing a lot more about all of this in the quarterly results conversations to come. A nod toward the future? You might have expected Cook to brush off Munster with one of his trademark “we don’t comment on future products” one-liners. But instead, Cook actually responded. Could it be shades of when Cook said “the wrist is interesting” a long while before the Apple Watch was announced? Or is he just trolling Gene Munster? Either way, the world is more fun when the CEO of Apple plays coy about future product directions, and launches thousands of pages of fevered speculation.